The Fishing is GREAT – already! 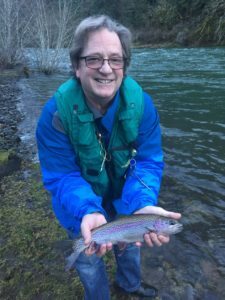 Wow – the McKenzie River is high and flowing fast – BUT, the good news is that the fish are already biting – nice size native rainbow trout! One of our guests (2/11) caught 2 Rainbow Trout – both around 16 inches long. Nice to know the native fish have had a good winter and are eagerly awaiting anglers. Remember – fishing here is fly fishing only and catch and release of all native trout. Come on over and try your luck right in our backyard! Hope Angler can catch more fish from McKenzie river after read your information. I think you can give more information for the Angler that can help them comfortable to fishing that place. What is the best season for fishing here? What kind of fish you got and max weight of the fish?